Often thought of as a traditional English garden flower, columbine has become a star of contemporary floral designs and garden pottery. It's sculptural petals read "Modern", creating an intriguing focal point in mixed arrangements. To best draw the eye to columbines beautiful form, display in a simple glass vase or grow in a potted plant without other plant materials. 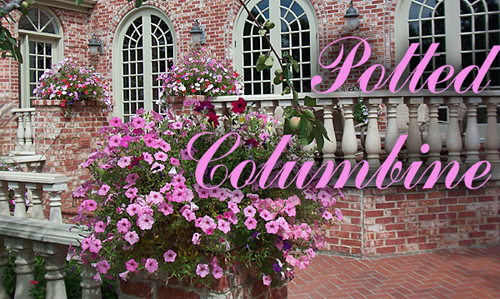 To extend the life of your columbine, plunge the fresh cut blooms in ince water and let them soak for up to an hour. Then fill a vase with lily of the valley with leaves intact. Next angle the lilies leaves outward to make supportive cradles for the columbine flowers. To finish add sprigs of fluffy white conium and classic bleeding hearts. 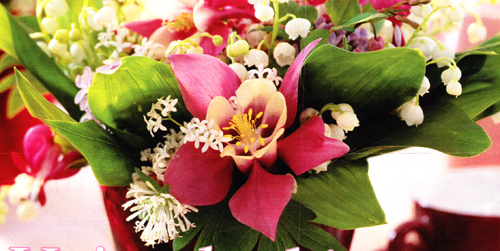 Bring your bright bouquet outdoors - hummingbirds adore columbine. Their little beaks fit perfectly inside the curved nectar filled petals. But to beckon the most winged lovelies to your arrangement, place it in a red glass container. This will attract the wee birds attention because they associate red with food sources. Read more.....Why grow in containers?